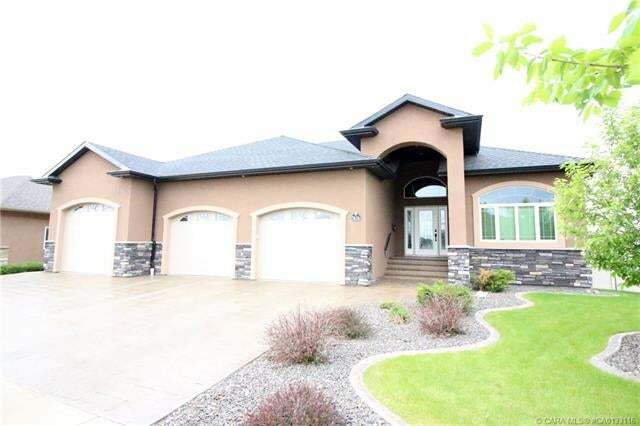 AMAZING CUSTOM BUILT WALKOUT BUNGALOW IN VALLEYVIEW! Youll love the Lifestyle and Impressive VALLEY VIEWS! Beautiful 1,650sq.ft. Walkout offers Exceptional Quality and Workmanship! Features an impressive open floor plan with 9 and 10 coffered ceilings, lots of bright windows, beautiful hardwood flooring, outstanding craftsmanship and detail. Exceptional presentation; Beautiful open stairwell and picturesque views from the great room with gorgeous stone fireplace. Exceptional kitchen, Granite, Large Island, 36 Gas Cook-top, Huge WI Pantry. Amazing Dinette/Deck views, garden door to awesome wrap around covered deck, its great for BBQs and entertaining. Spectacular Owner's Suite and Luxurious Ensuite! MF laundry. Excellent basement development, Cozy In-Floor Heating, walkout to huge patio, large spacious media/games area, bedroom, den and lots more! Oversized yard! AWESOME 26x28 and 14/18x44 attached heated garage, AC, BI sound system and more! Its Perfect, Youll Love It! Lot Size 0.32 Sq. Ft.